I had a bit of spare time last night so I decided it was time to set to and re-design this blouse pattern. First I took a few inches out of the waist to make it shorter but keep the shape. Then I used the general idea of this tutorial I mentioned before to remove the darts and make the front pattern piece into two parts which form a princess seam. 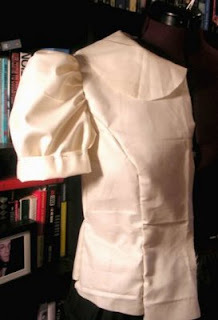 I made this toile to try it out with the sleeve and collar parts un-altered and it seems to work fine. The only thing I'm worried about is arm hole as I've made the seam cut into it I might need a bit more seam allowance there so it doesn't get too small. I usually make the arm cuff a bit bigger too on these kinds of blouses - but you'd only need to do that if you have flabby arms like me!